The day in the ATO zone yesterday started with a very intense night attack at Krymske. “It lasted almost one hour. Militants fired over 60 mortar shells and were actively shooting from light weapons,” informed Ukrainian Ministry of Defense spokesman on ATO – related issues Colonel Oleksandr Motuzyanyk at a press briefing at Ukraine Crisis Media Center. Later militants violated the ceasefire in Popasna district three times at dawn and in the evening. “There was no other combat activity in Luhansk sector,” added Col. Motuzyanyk. In Donetsk sector Russia-backed militants applied their efforts in three flashpoints – Zaitseve, Avdiivka and Shakhta Butovka position. “The enemy was traditionally active in the afternoon and used heavy weapons – mortars and a tank. They launched almost 60 mortar rounds and shells,” said the spokesman. Ukrainian troops actively responded with fire at least seven times in different frontline areas. “Another hostile attack occurred in Novoselivka Druha. The armistice held at Svitlodarsk area and in Donetsk airport yesterday,” added Col. Motuzyanyk. In total, 14 hostile attacks happened in Donetsk sector yesterday, and five involved use of heavy weapons. In Mariupol sector, Russian proxies were attacking along the entire frontline. “Mortar attacks occurred in Maryinka and Chermalyk. Moreover, militants conducted a staged artillery attack in the vicinity, and it posed no threat to the troops,” said the spokesman. Low and medium intensity firefights traditionally took place in the south – in Pavlopil, Vodiane and Shyrokyne. 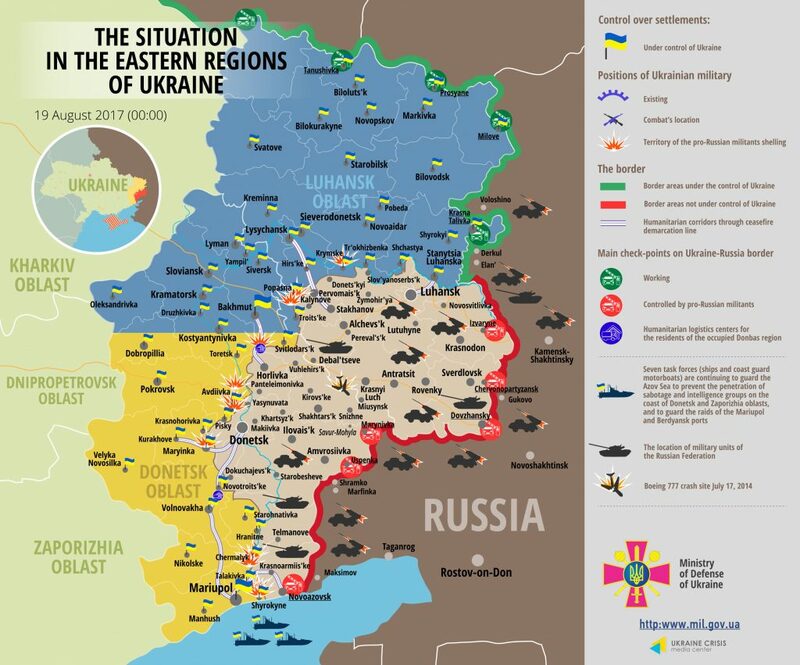 No Ukrainian serviceman died in action in the ATO zone yesterday, but three troops were wounded. Report on the military developments as of August 18 is available here. Interactive data on the shelling: chronology shelling chart and the interactive map.